By the time Grumman’s F9F-2 Panther was entering fleet service in 1949, the advantages of swept wings had already been proven by the North American F-86 Sabre which had flown in prototype form within months of the XF9F-2. The big question posed by this development for naval aviation was, could a swept-wing jet - with all its low-speed control difficulties and need for a higher landing speed - be tamed to the point it could be brought aboard an aircraft carrier? There were those naysayers -as there have been at every technological advance related to naval aviation - who thought otherwise and predicted that the new developments in jets would make the aircraft carrier obsolete. Most of these people wore black shoes with their uniforms. Grumman was of the belief that if a swept-wing Panther was to use the same low-speed control devices as the Panther used - leading edge slats and large flaps - that the problem could be overcome. In anticipation of the Navy agreeing with them, the company initiated initial design studies. It didn’t take the Navy long to discover that their new Panther could only stay in the same sky with the MiG-15 by dint of superior pilot ability, when Panthers tangled with MiGs in the fall of 1950. The Navy suddenly wanted swept wings, and they wanted them fast. The Grumman proposal for a swept-wing Panther looked like a way to do that with minimum difficulty and maximum quick time frame. By the time the Navy decided to proceed, the higher-powered F9F-5 Panther was in production. The XF9F-6 swept-wing prototype was an F9F-5 with minimal changes to put wings and horizontal stabilizers swept back 35 degrees on the Panther’s fuselage. The prototype flew on September 20, 1951, and flew well. With the added kick of wartime, testing went forward and it was carrier-qualified in the early spring of 1952. By that time the Navy had ordered it into production and Grumman had given it the name “Cougar.” VF-32 became the first squadron declared operational with the Cougar in December 1952. Maximum speed at sea level was 650 m.p.h. - a very useful increase over the Panther - with 590 m.p.h. possible at 35,000 feet. Not only that, the Cougar could pierce the still-dangerous “sound barrier” in a dive - not by much, but still it did it. 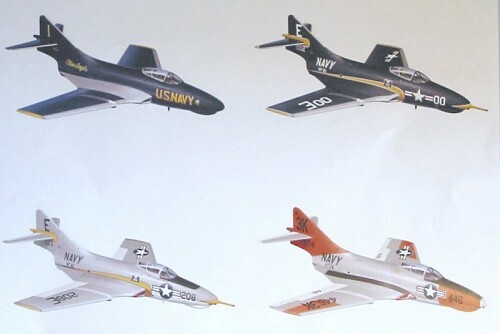 The most notable event in the history of the F9F-6 came on April 1, 1954, when VF-21 flew three Cougars from NAS North Island to Floyd Bennet Field, New York, with LCDR F.X. Brady setting a transcontinental speed record of 3 hours, 45 minutes and 30 seconds. The definitive Cougar was the F9F-8, known to Grumman as the G-99. There were many changes over the earlier airplane, the most noticeable of which was the wing. Wing chord outboard of the fences was increased, giving the leading edge a sawtooth that made the Cougar definitely supersonic in a dive with better control. The leading edge slats were deleted while the new leading edge had increased camber which improved stability and handling at low speeds and high angles of attack - important for “coming aboard.” The large trailing edge fillet extended the length of the fuselage. The large wing increased internal fuel capacity to 1,063 gallons, while new 150-gallon tanks could be carried. The F9F-8 was also capable of in-flight refueling with a nose probe installed at the factory. With similar gun armament, the F9F-8 could also carry four new Sidewinder missiles, as well as a substantial underwing bombload that eventually included a nuclear device. The Blue Angels finally turned in their Panthers for good at the end of the 1955 season (when I saw them) and converted on to the F9F-8 (which I also saw them fly) that equipped the team until 1958. The prototype F9F-8 - an F9F-6 with the new wing - flew on December 18, 1953, and the first production airplane flew a month later, on January 18, 1954. Squadron service was initiated rapidly and more Cougars were on carrier decks in the late 1950s than any other type. After leaving first-line fleet service at the end of the 1950s, the F9F-8 flew on with the Reserves and as a single-seat fighter trainer in Naval Air Training Command until 1971, long after all its contemporaries - as well as its replacements, the F-11F-1 and F3H-2 - had been sent to the boneyard. Along with the F-14, it was Grumman’s most successful jet fighter. Up to now, the most accurate kit of the F9F-8 Panther has been the 1/72 kit released by Hasegawa around 1977. 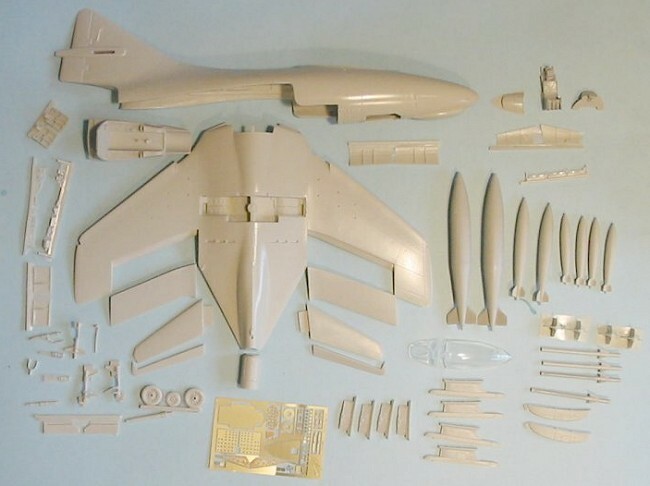 I believe ID Models released a 1/32 Cougar vacuform, and Combat Models might have also, but those were companies whose products this aeronut learned early on to stay well away from. This kit is without a doubt the finest model of the Cougar ever created. Period. Hands-down. No competition. Like me, Paul Fisher grew up watching Panthers and Cougars of the Blue Angels fly overhead, and he never lost his love for them. Anyone who knows of Paul’s car models will know that Fisher Productions has its own standard of excellence, one that other resin kit manufacturers can dream about and aspire to, but seldom achieve. I was knocked dead when my friend Robert Arance showed me a test shot of the F9F-5 Panther. It was, quite frankly, the best resin kit I had ever seen. Well, the F9F-8 follows that tradition and is tied with its predecessor for that title. The design of this kit is the best I have ever seen in any model. A modeler who lacks opposable thumbs and a neocortex could successfully assemble this model! I don’t see how anyone could mis-assemble it, other than to perhaps get too much CA glue in the seams or something. Anyone who can touch their forefinger to their nose three times in succession will have absolutely no problem with this model. Strictly assembled out-of-the-box, this will be a beautiful show-stopper of a model. What is here is the basis of a Nats Best of Show winner for the modeler who wants to add any level of additional small detail (and small detail will be all you need) to the kit. Perhaps the only “problem” would be to create a late-production airplane with the splitter plate in the intakes, since these are not in the kit. Decals are provided for the CAG airplane of VF-61 in Glossy Sea Blue, a later VF-61 airplane in gull-grey/white, a fighter-trainer from VT-24 (which could easily become even more colorful for the modeler with photos of this airplane later in its life), and the team leader’s airplane for the Blue Angels. I have been lusting for one of these models since I first saw the Panther kit, and what is in the box definitely does not disappoint. I had to exercise serious self-restraint to not dive into it like a ravening beast before taking the time to put everything out and take a photograph of the parts for this review. Construction is already in progress and is living up to all my hopes. Yes, it’s expensive - but unlike other 1/32 kits in a similar price range, you won’t find anything to complain about when you open this box. Soon to be the subject of a full-build review! !